The Krehbiel Krew: My Whiz Kid! 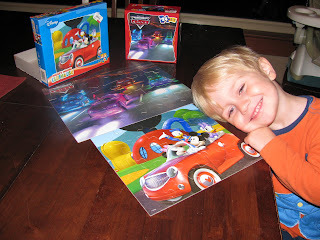 I am so impressed with Jak's puzzle skills!!! 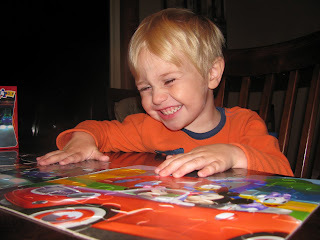 Today Aunt Kylie brought over two, 25 piece puzzles for the kids to play with. Jak was so excited! He sat at the table and started working on them. About 30 minutes later he started yelling "mommy, mommy come look!!" I went in the kitchen..and WHOA!! He had finished both puzzles! He must be a natural at puzzles, just like his Great Papa Bill!! This is Eva with her 3 favs...... pink cowgirl boots, cookie pillow, and Cookie Monster book. What more could you want? glad to see him enjoying them! 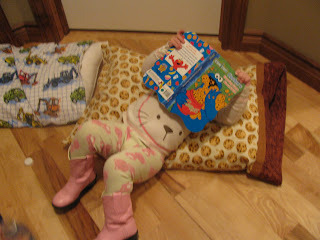 I knew he would be great at them - he's such a little smarty pants.